This feature appeared in Rock and Ice issue 200 (March 2012). Only select features from print issues of Rock and Ice appear online. To enjoy the full array of writing and imagery in Rock and Ice subscribe here. Above Photo: Sasha moments after her big send of Pure Imagination (5.14d), Red River Gorge, Kentucky. Photo: Keith Ladzinski. A white dry-erase board hangs over Sasha DiGiulian’s desk at her family’s home in Alexandria, Virginia. The town house is, as she says, “really tall and really skinny,” a seven-story structure in the cobblestoned Old Town area of riverside shops and restaurants, and in her “fully pink” room is a huge (as in, bed-sized) stuffed dog named Penelope, posters of penguins and of Chris Sharma climbing Biographie, and a closet overflowing with “stripes”—clothing by Adidas, with which she signed a contract last summer. Toward the end of every year Sasha writes a list on the board of what she wants to achieve in the next annum. Recorded in the waning days of 2010, her goals for 2011 were, she recalls, “to get into college, onsight 13d and redpoint 14c. And [to] podium in an international event.” She took a calendar and worked out a plan for all the competitions and outdoor climbing she wanted to do. The first goal on the list materialized late in the year. She was accepted “early decision” to Columbia University, which received a record number of applicants and admitted a miniscule 6.93 percent. In July Sasha gained the podium at not just any sparkling international event but the celebrated World Championships, in Arco, Italy, attaining second in bouldering and making the lead finals to win the overall gold for combined events. On rock, a spectacular yearlong ascendancy began in March, when in one week she onsighted the Red River Gorge’s Omaha Beach (confirmed 5.14a after holds broke), then climbed the 5.14c Southern Smoke in only six tries. She closed her trip to the Red with a quick six-try redpoint of the powerful, reachy Lucifer (5.14c). At this point Sasha has onsighted so many 5.13s that when asked the sum, she says, “Off the top of my head I don’t know.” A look at her 8a.nu log as of this writing shows her onsighting 33 out of a total of 86. She has climbed a solid 16 different 5.14s. It was a year in which she was hailed by the IFSC as “the brilliant American,” and dubbed “sensational” by 8a.nu and “astounding” on the official Arco website. In her first season on the circuit, Sasha made the finals of each lead World Cup event she entered. Considering that in today’s landscape of elite World Cup athletes, whose training is very regimented, only a fraction climb outdoors regularly, her rock record is even more emphatic. She has just turned 19. 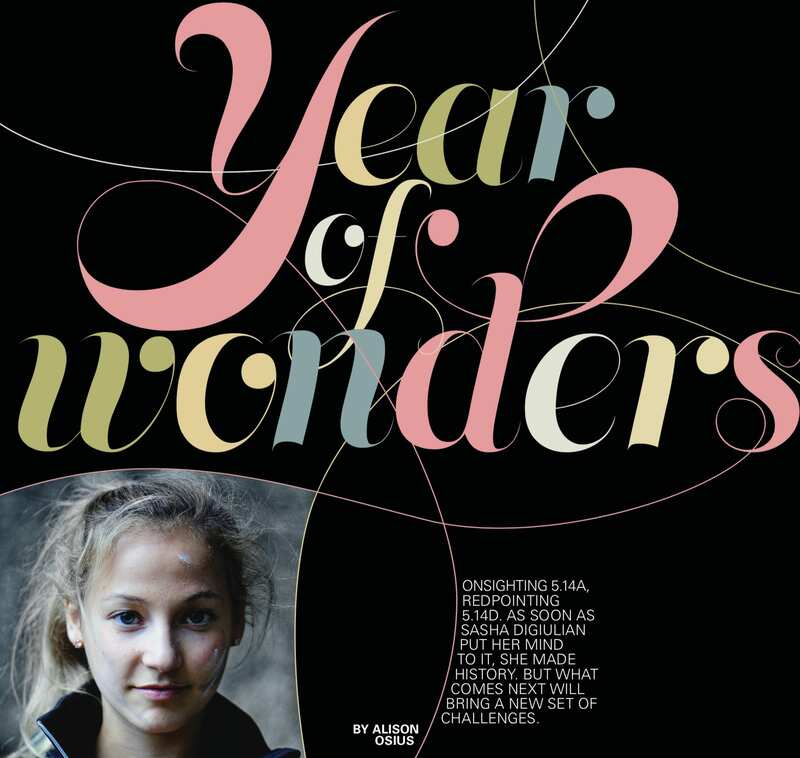 Four years ago, in autumn 2007, this magazine published a story on promising young climbers that featured a cheerful-looking, gap-toothed 14-year-old. The ninth grader had already sent Bazooka (5.13b/c) in Maple Canyon, onsighted up to 5.13a/b, and at 13 flashed Zero Zero (V10) in Squamish. We asked most of the featured youths questions such as, “What is the Hinterstoisser Traverse?” and recorded their hilariously varied answers. I would just like to make one correction; it is stated that I am the National Champion for Junior Bouldering in 2006, and that is a mistake. I did not win that competition. I am the National Champion for Difficulty (2006) and the North American Champion for Difficulty (2006). I would hate to take credit for someone else’s accomplishment. P.S. Mount Everest is not 29,000 kilometers as I said; I meant feet! And the Hinterstoisser Traverse is on the North Face of the Eiger. It’s named after Andreas Hinterstoisser—one of the guys who died trying to get the first ascent … Right?! She’d gone away and looked it up. We thought that was pretty good. DiGiulian, a sprite (5’2” and 95 pounds) in turquoise Adidas warmup jacket and white pants, sits at a table at Vic’s Coffeehouse in Boulder, having arrived way more fresh than should be expected after travel from a comp in Puurs, Belgium, the previous weekend. It is Friday, and tomorrow will bring a weekend lead World Cup in Boulder, the first on U.S. soil since 1990. She was driven here by Emily Harrington, whose counsel she seeks and values. Emily, 25, a pro athlete and a onetime world champion who just this summer climbed two 5.14b’s, pulls out a computer and seats herself at a table just around the corner. Sasha and Emily were already in line and had purchased bagels and coffee when I arrived early for the meeting. Both of them were soon to leave for China on a Petzl RocTrip. When asked, Sasha counted off that, for climbing, she has traveled to Switzerland, Italy, France, Spain, the Czech Republic, Norway, Belgium, Portugal, Ecuador, Mexico and Canada. Sasha is courteous and contained, yet forthright; she answers questions fully and attentively. She maintains an ebullient website that celebrates (with writing often in big pink letters) companions, travel, aesthetic routes, and chances to practice her Spanish. Upon high-school graduation in mid-June, she headed to the training hotspot of Innsbruck, then climbed and competed in Europe until October, though flying back to Salt Lake City to appear at the Outdoor Retailer trade show. Ducking out from that to Maple Canyon for a getaway afternoon, she walked up and did Millenium (5.14a) on her first try (not onsight due to a try three years ago), did Wyoming Sheep Shagger (5.13d) second try, and onsighted Toxic Turkey (5.13c). 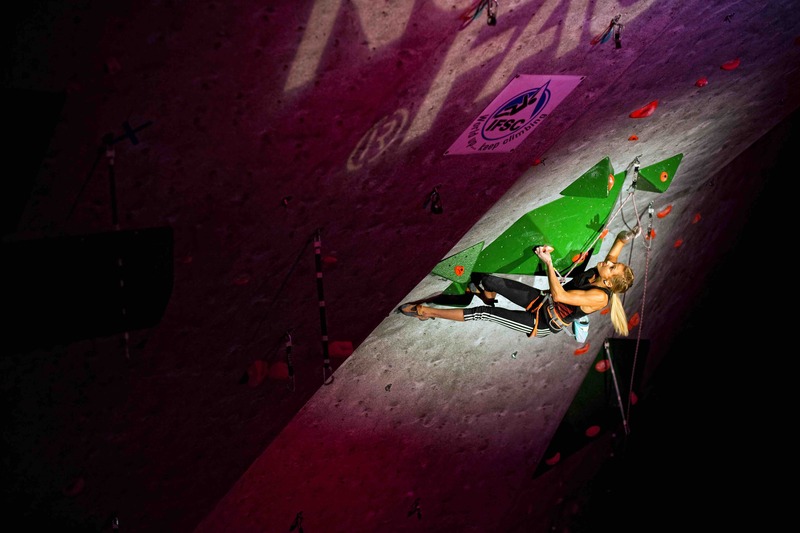 She entered five major comps: the World Championships; three lead World Cups on the 10-stage circuit (she placed eighth in Chamonix and sixth in Puurs, and would be seventh in Boulder); and the European Youth Cup, which she won, in Imst. In September, over 20 days in Spain, she climbed 20 routes of 5.13d or harder. During a single day at Rodellar, she onsighted Maskoking (5.14a), Eclipse Cerebral (5.13d) and True Crime (5.13b); she did four 5.14s at the area. 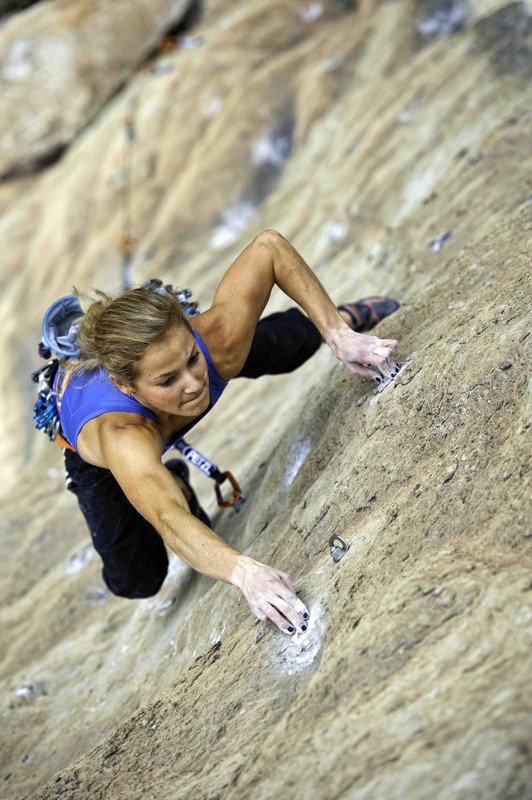 At our October 7 meeting, Sasha says one of her goals for 2012 is to climb 9a (5.14d). She is, however, to achieve that goal only eight days later, on October 15, with Pure Imagination in the Red River Gorge, done in her apparently custom six-try style. The grade, a magic number, has been reported as climbed by only two other women, Josune Bereziartu (who has clocked two 9a’s and one 9a/9a+, meaning 5.14d/5.15a) and Charlotte Durif. Though Durif, 21, is clearly a world-class climber, some of her ascents have been disputed, in part because her only witness has been her father, and when she was a teen the father apparently misunderstood the definition of onsighting. In the world in which she travels, Sasha hears all the opinions. When I ask about the issue, she replies in measured tones. “If she is lying I just find it a little heartbreaking that someone would do that to the sport,” she says. “If she’s telling the truth, maybe I can just do my best to climb a 9a and then a 9a+. I can only care about myself and achieving what I’m capable of and pushing my own limits.” On her blog Sasha credits Charlotte, and calls herself the third woman to climb the grade. She is also the youngest. In Outliers: the Story of Success, the bestselling author Malcolm Gladwell identifies an “ecology” of elements that allow talented people to achieve super success. The conditions he explores begin with hard work, and he identifies a 10,000-hour rule for the amount of sheer practice required for great skill in anything. In Sasha purposefulness is innate. Vadim Vinokur, a former coach, while also praising her composure, cites “an incredible level of tenaciousness” as Sasha’s greatest asset. Think pink. DiGiulian at 18 on Golden Boy (5.13b), at the Red River Gorge, Kentucky. The area will become her proving ground. Photo: Chris Noble. Other key elements, according to Gladwell, are familial, economic and situational. They include access to education or coaching, and even pure chance. Bill Gates was brilliant and he also succeeded because in eighth grade he went to a private school in Seattle that had a computer terminal in an era (1968) when college students lacked them. He also lived very near the University of Washington, which allowed use of its mainframe at certain hours. At age 7, Sasha attended a birthday party for her brother at the local climbing gym, Sport Rock II. She grew up in the D.C. area in a family that valued academics first but also athletics, and put time and resources into them. Sasha’s father, John Anthony DiGiulian, owns a marina in Dundalk (Baltimore), and a rock and marble quarry in Tennessee, and her mother, Andrea, stayed at home and was willing to shuttle two young athletes—and belay one of them—near endlessly, and to travel with Sasha to Europe about twice a year. The parents were athletes themselves: Her father played football in high school, and Andrea, who is from Montreal, swam, ran and did gymnastics. Andrea’s whole side of the family is made up of skiers and skaters. “I’m the misfit,” Sasha jokes. Her brother, Charlie, grew up playing hockey, and young Sasha figure skated competitively until age 10. Charlie, now 20, is not only a hockey player at the college level, he plays at McGill University in Canada, land of hockey love. The two were in school together until 9th grade, when her brother went off to prep school at Phillips Andover in Andover, Massachusetts. Sasha remained at the Potomac School, a well-known private preparatory school, located on a 90-acre campus three miles outside of D.C. It has graduated such alums as David Guggenheim, director of An Inconvenient Truth, and Rory Kennedy, documentary filmmaker and daughter of Robert F. Kennedy. 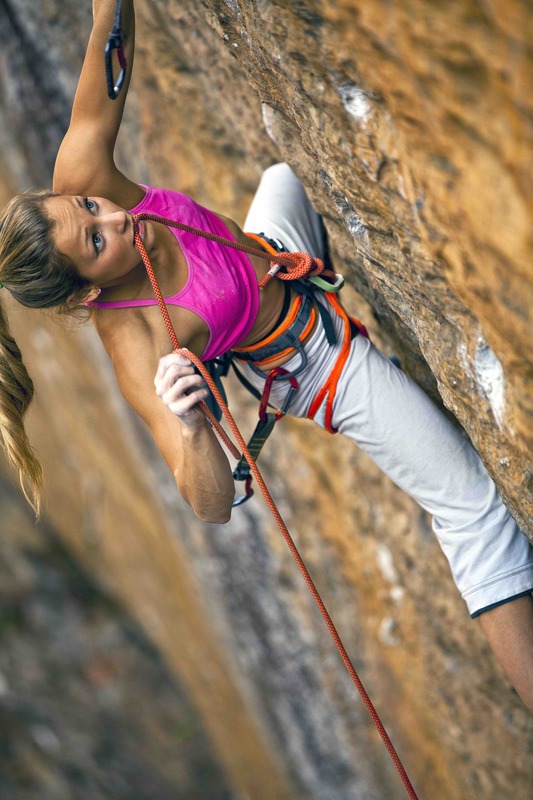 Once Sasha started climbing, she was hooked, and her various other sports faded in importance. She joined the gym’s junior team and climbed once or twice a week until the day she found out about competitions, walking into the gym on a Saturday morning only to see a JCCA regional comp underway. Simply wanting to climb that day, she asked permission to participate, and won her category. In 2001, the autumn she turned 9, she began working with Claudiu Vidulescu, who is head coach for the National Junior and Adult Team, and lived in the area at the time. Asked for an assessment, he says, “I think she is by far the most determined and committed climber I have ever worked with. She has always been a very happy and joyful athlete, but when it came to work she was all business. Homegirl: DiGiulian rises to seventh, the only American woman in finals, at the first lead World Cup on American shores since 1990, held at the Movement gym in Boulder. Photo: S.J. Geicold Photography. By her young teens Sasha was competing in local comps, regionals, divisionals, nationals and youth world championships. She won four consecutive titles in the Junior Continental Championships, held every other year, starting in Mexico City in 2004 and ending in Ibarra in 2010. She also won the Junior PanAmerican Championships in Ecuador, and, in Boulder last April, the SCS (adult) Open National Championships for the second time. Right now Sasha has taken a gap year to climb, deferring admission to college until next fall. Students used to have to move South or West if they wanted to climb, but in today’s Manhattan are the climbing gyms Chelsea Piers and Brooklyn Boulders, already familiar locales to her. She began intermittent but regular coaching sessions with Vinokur in New York four years ago, driven the five hours each way by her mother. In the summer of 2010, at age 17, Sasha spent three months climbing in Europe with her then boyfriend Magnus Midtbø, sending Welcome to Tijuana (5.14b) and Philipe Cuisinere (5.14a), and onsighting up to 5.13c at Rodellar. 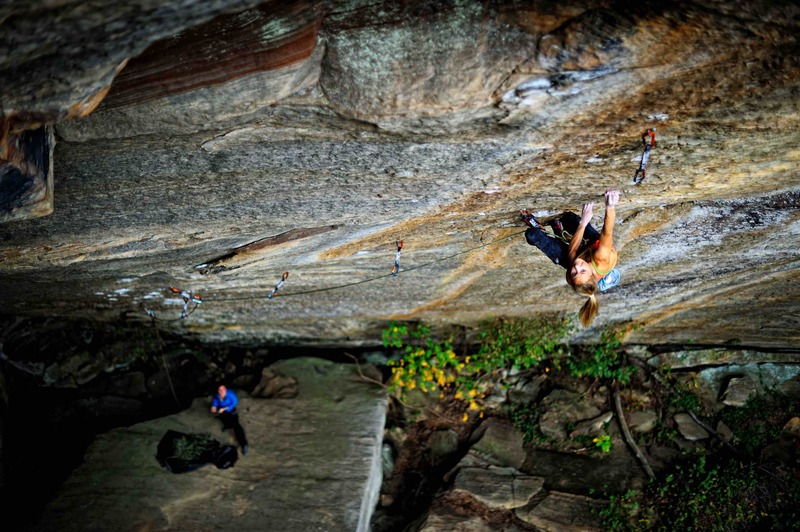 Aside from another 5.14a in Rodellar in 2009, her other 13 5.14s were all in the blowup year of 2010. She and Midtbø broke up last spring, and she went to Europe on her own—quite an undertaking for someone too young to rent a car. Did she ever feel left out? We live in an era in which overwhelming demands are made of high-school students; even parents wonder when teens are supposed to hang out. Yet Sasha appears to have thrived in high school. She was curious and diligent, with a knack for time management. Now backed by Adidas, she is traveling the world climbing, momentum building on itself. Still, she maintains the college plan. Asked her strengths and weaknesses as both a climber and person, Sasha says her climbing weaknesses are dynamic movement and power. Her best suit is long, enduro, crimpy routes on rock with some intermediates. Above the lush green on Candide (5.11d) at the Great Arch, Getu Valley. Photo: Sam Bié. We all know the enduring enticement of climbing, because it is beautiful and exhilarating—and progress is measured for us minutely. If someone climbs 5.14c almost by accident, and is observed to make it look like 5.11, how could that person not want more? As slated, the lead World Cup circuit starts in Paris in September, when fall semesters start. “What are you going to do?” I ask her. “I have no idea,” she says. “I know I want to be at the World Cup. Do you know if Columbia ever lets you start in January? Being visible means observed, and this year a series of comments on the internet asked whether her slenderness was extreme. Given that eating disorders are a serious concern, open discourse may overall be healthy, especially considering that they are found primarily in girls and young women. But to her the public notion was a new kind of surprise, one she called hurtful and, as a role model, worrisome. She denies it soundly. “I like to eat healthy,” she says. “I don’t like not being active. I started seeing people saying, ‘Oh, she’s too thin,’ [but] if you’re active and eating healthy then you’re going to look fit. This year Sasha can have been expected to write on her white board again. Climb 9a+ [5.15a]. Onsight 8c [5.14b]. Podium in international events. “Academically, stay on top of things,” as she puts it. For 2012 she intends to train bouldering, attend ABS and SCS nationals, take a trip out West, go to Europe for bouldering and lead World Cup events, and climb in France and Spain. Fall will bring a new phase, the daily life of a college student at a demanding university. It is the obvious potential speed bump, or detour. Having been another major talent who was also a top student, Harrington sees something of herself in Sasha. “I was the same way: driven, hard-working, and [with] high expectations. But I was also a bit lost at that age. Unsure if climbing was really my passion, or if I just did it because I was talented. I think Sasha really is passionate about climbing. She’s far more lighthearted and easygoing than I was. I think she has more fun. She can combine lightheartedness with her climbing and school. Alison Osius is executive editor of Rock and Ice.